Each week Jake proposes a theme for creative inspiration. You can post your interpretation to the theme on your blog anytime before the following Sunday. Remember to post your link in the comments section. I know today is Friday, but I’ve been behind all week. Here is my photo for sunrise. 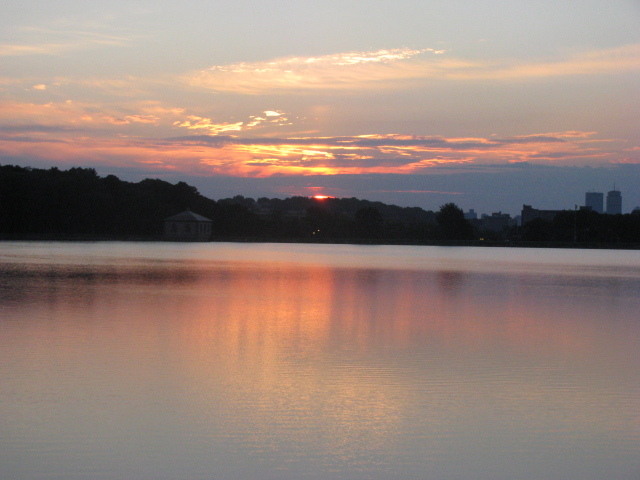 I took this photo when I lived in Boston and I used to live right across the street from the Chestnut Hill Reservoir, where I would take my dog for a walk each morning before work. Not a bad way to start the day. For other sunrises please visit this page. This entry was posted in Sunday Post and tagged Boston, Chestnut Hill Reservoir, Life, Massachusetts, Photography, Photos, Sunday Post, Sunrises, Walks. Bookmark the permalink. Beautiful sunrise and reflection of colors on the water! When I first moved to Boston I lived not far from there – up on the top of the hill by the dojo and the elementary school. How neat. O my!!! that is so beautiful! !